Evelyn Bohn and Amanda Jameson, McMaster University Studio Art students and new leaders of Sketching Thursdays. In the Jaime Angelopoulos exhibition. We are delighted to announce that Evelyn Bohn and Amanda Jameson, two students in McMaster’s Studio Art B.F.A. 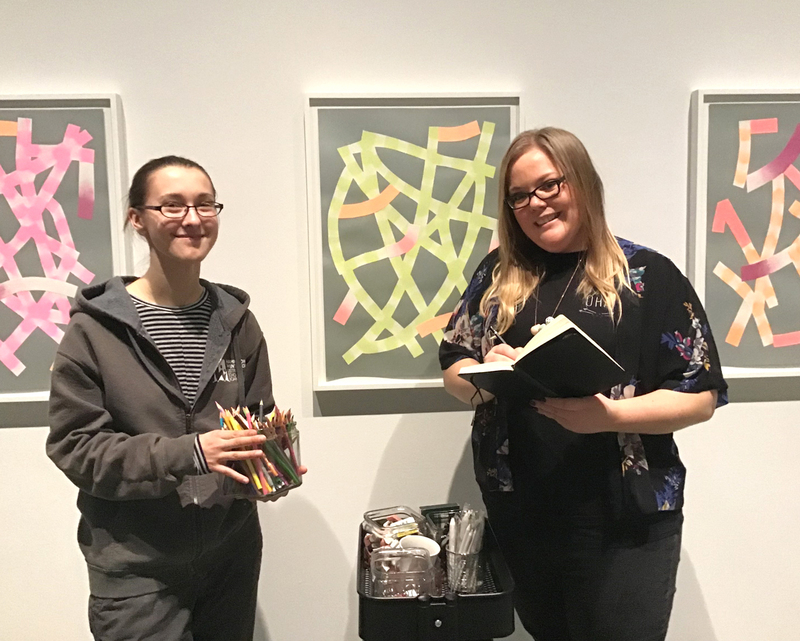 program have stepped up to lead Sketching Thursdays at the Museum until March 14 (excluding Thursday February 21, Break Week). Starting this Thursday January 17, 2019, they will be at the Museum, ready to teach, guide and encourage participants from 12:30 to 1:20 and 4:30 to 6:30 pm. “We are really looking forward this and are introducing a new sketching challenge each week,” adds Amanda. Sketching Thursdays is a free, drop in event. No registration required. The Museum provides the art supplies and the inspiration. Participants are welcome to sketch independently or get started with a little help from Evelyn and Amanda. This Thursday, January 17, is a special session – Participants will also have the opportunity to meet the artists who inspired them and enjoy some light refreshments. Our Opening Reception for Winter exhibitions runs from 6-8 pm. Free and all welcome.